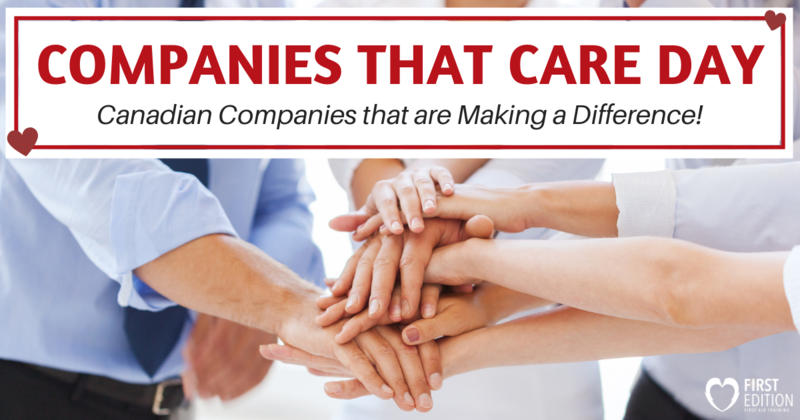 Companies that Care Day – Canadian Companies that are Making a Difference! 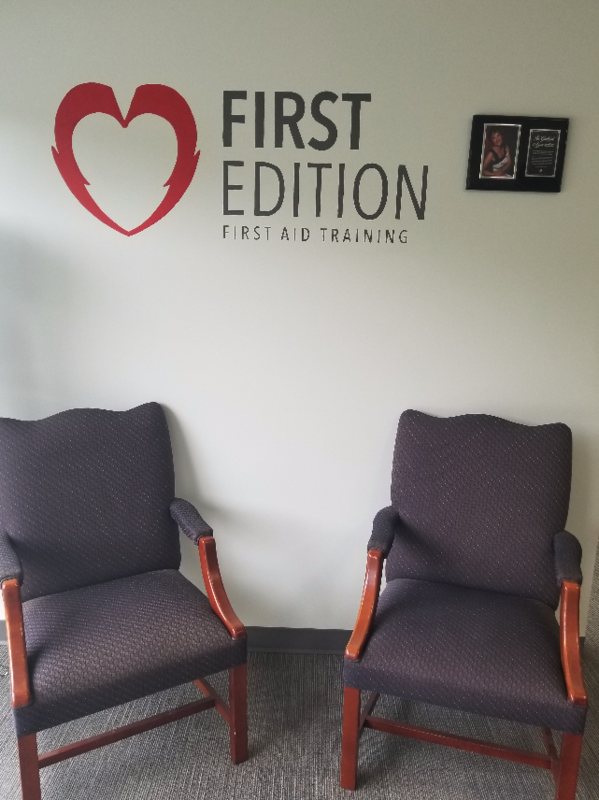 - First Edition First Aid Training Inc.
Home / Blog / Aed / Companies that Care Day – Canadian Companies that are Making a Difference! There are so many things a company can do to show their support for the community, the city, and the country. Many Canadian companies display they are socially responsible by matching donations, create a fantastic place to work for their employees, and some even go above and beyond to ensure the general public is protected in case of emergencies. It is still not mandatory in every province for a company to have an AED (automatic external defibrillator) onsite – and because it is not mandatory, many locations do not have them. Malls, construction sites, local gyms, schools, and a number of other locations are missing the one thing that could save a life. As well, many workplaces do not require their employees to receive first aid training. It is for this reason that we want to take a moment to recognize our partners – the Canadian companies who have recognized this disparity. These businesses have seen the use and need for AEDs and first aid training and have gone above and beyond to ensure the public can attain the items and skills needed to protect others. Take a look at a few of our partners who are making safety and preparedness their priority! Based in Winnipeg, Manitoba, Heart Beat Inc. has been training individuals exceptional first aid as well as CPR since 1984. This caring company offers a wide variety of course levels that includes everything from basic first aid to international trauma life support and more. In addition to their training, the company sells medical and safety equipment that can be used to protect and educate the public. Many Canadian companies understand that preparedness is the first step towards safety, an idea that Columbia Fire & Safety Ltd. promotes. This BC business is ensuring that there is access to the numerous safety products necessary to make a difference in emergencies. Fire extinguishers, survival kits, traffic safety, respiration protection, and many other safety products are available at Columbia Fire & Safety Ltd. When it comes to finding an AED perfect for your workplace, AED Solutions is popularly sought out for their defibrillator expertise. This Canadian-wide AED sales company is comprised of team members with paramedic and AED specialist backgrounds. Their online AED directory offers customers the ability to browse defibrillator selections to find the one that will best suit their work situation. As an industry leader of first aid training in Ontario, Heartsafe EMS is a company that truly cares about the safety of the public. Through their in-depth courses, each training opportunity offers individuals confidence, knowledge, and the skills needed to assist in emergencies. Each of their courses produce knowledgeable certified individuals who are ready to jump to action should things take a turn for the worse. For a complete list of Canadian AED distributors near you, check out our retailer web page for more wonderful companies who are making a difference, daily! Across Canada there are many initiatives, organizations, and charities – all who are working to create a heart-healthy world. Of the many charities that are continuously seeking health solutions and striving for a safer society, the following are some that First Edition supports whole-heartedly! The Heart and Stroke Foundation of Canada has been dedicated to fighting heart disease and stroke for over 60 years. Through fundraising, donations, and educational opportunities, this charity is improving the health of the public and promoting heart-healthy lifestyles for all. First Edition is proud to donate partial proceeds of all AEDs purchased each February for Heart Month to the Heart and Stroke Foundation of Canada! The Canadian Transplant Association is a team who is “compromised of transplant recipients, athletes, and volunteers dedicated to promoting organ donation through public advocacy and events.” The organization endeavours to increase awareness and promotion of how organ donations can help, as well as to improve the lives of those in need of a transplant. Many of the First Edition staff have become organ donors or donated blood and plasma and are happy to assist the health of others any way they can! Helping Canadians for over 100 years, the Canadian Red Cross is a humanitarian network working to provide relief for those affected by emergencies and disasters. Assisting directly by a variety of methods, the Canadian Red Cross also seeks out solutions to equip Canadian companies with the resources they need – such as first aid, certification program assistance, and more. 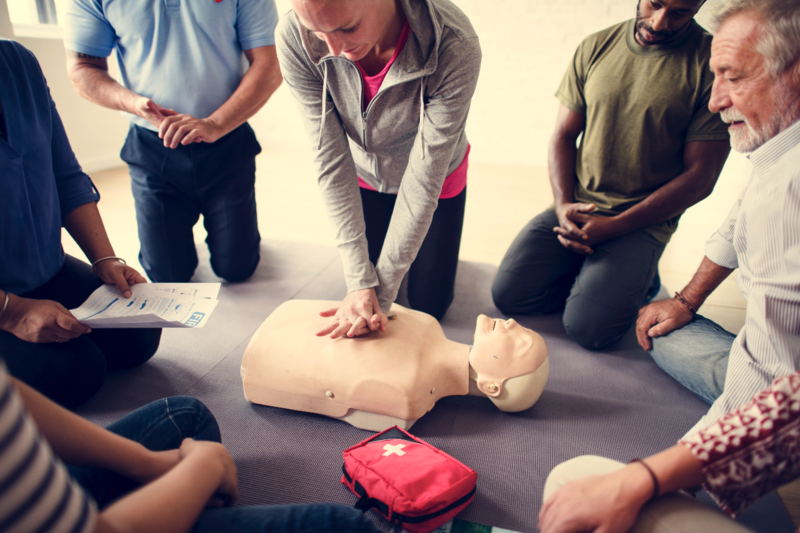 All group, company, and private first aid training in Calgary provided by First Edition is centered upon the knowledge and curriculum of the Canadian Red Cross! Want to know about the other amazing charities that are warming hearts and improving health? Be sure to check out our blog for our monthly Heart Warming Charities feature! First Edition is a company that cares about people. From the first days of its creation, First Edition has always had the health, wellbeing, and safety of Canadians at heart. It began in 1995 when our founder, Jan Kirkpatrick, created ‘Heart 2 Heart’ – a first aid training company that focused on business and youth education. Time passed, and her passion for people continued, and in the year 2009, First Edition had its first employee. The primary focus of the company shifted slightly to become more AED focused and Jan went out of her way to ensure that businesses around Canada had the means to save a life. After much research, the company had decided to distribute Philips AEDs for their quality, ease of use, and best-in-class performance. It is these AEDs that First Edition has delivered to businesses across the country – protecting hearts, and saving lives. Sadly, in 2016, our fearless founder passed away, but her legacy and passion live on. The family-run business continues to carry on her message, and the entire staff has helped to make enormous strides in the safety industry! 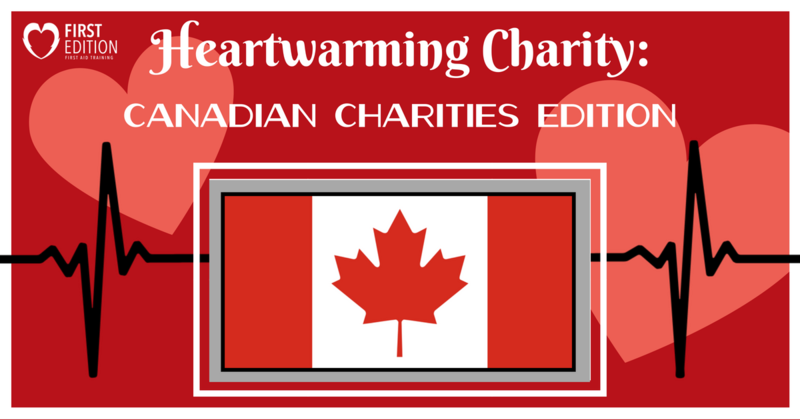 First Edition wants to thank all the Canadian companies and charities who are making a difference! Without you, the world would not be the caring and heart-warming place it is today. We thank you from the bottom of our hearts. Are you a company that wants to take your care further? Are you looking to purchase an AED for your business? Amazing! We would love to connect with you and determine the best safety packaged for your specific location – whether that is a café, a work truck, an elementary school, or your own home! Contact us and together we can improve public safety!